Vegetarians, you may just want to marry me after eating this burger. It is UNBELIEVABLY good. I am not a vegetarian, and I’d eat this quinoa burger a million times over again. Granted, this is a 9 Points Weight Watchers Recipe, BUT, because the burger patty is made with quinoa and white beans, it’s incredibly filling. I also used a real brioche bun, to give it that added gourmet flair. You could shave off another Point or two by using a sandwich thin or another light bread roll. The caramelized onions really give it a that extra something special, and the chipotle lime mayo ties it all in perfectly. It’s truly a unique Weight Watchers Quinoa Recipe like you’ve never had before. Pair it with a light salad, roasted veggies or a low calorie soup for a complete meal. 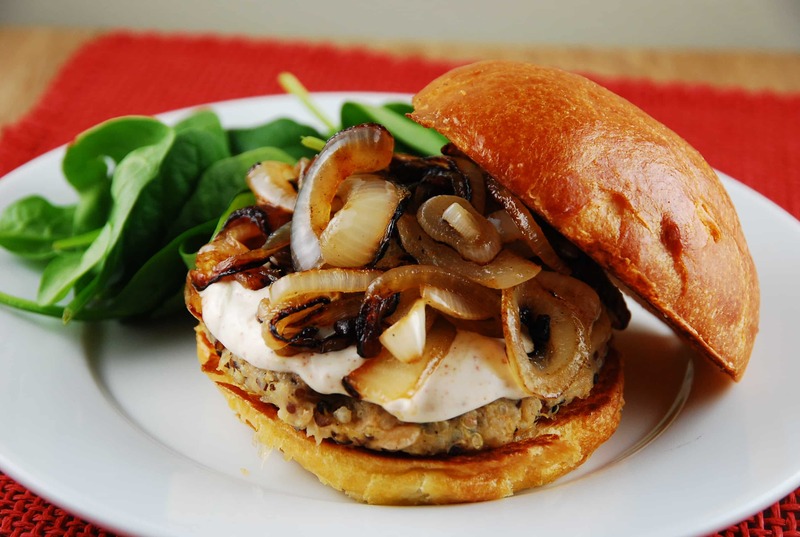 This vegetarian burger recipe is a must try, folks. These fantastic quinoa burgers are as incredibly delicious and filling, as they are beautiful! It’s a Weight Watchers vegetarian recipe for those who crave a hearty, satisfying meal with a gourmet flair. While quinoa is cooking, place beans in a large bowl, and mash well with a fork. Add in cooked quinoa, cheese, egg, panko, garlic, paprika, coriander, and salt & pepper. Mix well with hands. Form into 8 patties, place on a plate, cover with plastic wrap and place in the refrigerator for at least 3 hours. yeah… you might want to include the refrigeration time in prep time somehow. there goes that dinner for tonight! These look amazing. Can I freeze the patties before cooked? I only need two at a time. Yes! I did this and it worked very nicely. They were sooooooo good! Onions can make anything delcious. Do you know what the points value is if we don’t use the hamburger buns? I made these burgers last night, mayo and onions too. Oh my goodness, let me tell you all of it was super deelish. Even my picky husband who won’t eat anything remotely veggie loved the burgers. This is a keeper and I will be making them again.